Why is there a Trust? SGT Gary Francis, from the Sydney-based 2nd Commando Regiment, died during a training activity on Mount Cook in New Zealand on July 16, 2014. The 44-year-old former Royal Marine was leading a group of 10 Commandos on a two-week Mountain and Cold Weather Operations (MACWO) exercise when he plunged 40 metres down a crevasse on the Grand Plateau. Sergeant Francis was leading his team on a crevasse rescue exercise at the time of his death. During the rescue exercise the team would climb down into the crevasse and then use one member as the patient for the extraction exercise. Normally the team would be roped together for the actual exercise but Sgt Francis was surveying the crevasse for its suitability when the crust gave way and snow collapsed around him. Another commando, who is also a former Royal Marine, led the recovery of his mates body and the men administered first aid but sadly were unable to revive him. Sgt Francis had been the ADFs MACWO subject matter expert since January 2011, a year after joining 2nd Commando Regiment at Holsworthy. The Englishman, originally from Welling in South East London, previously spent 13 years in the British military as a Royal Marine Commando Mountain Leader before moving to Australia in 2010. SGT Francis is survived by his wife and two children. Lance Corporal Todd Chidgey was serving with a Protective Security Detachment providing protection for a senior Australian officer at Headquarters International Security Assistance Force Joint Command. Lance Corporal Chidgey died in a non-combat related incident in Afghanistan on 1 July 2014. He is survived by his mother, father, brothers and partner. Twenty-nine-year-old Lance Corporal Chidgey was born in Gosford, New South Wales, in 1985. He joined the Australian Army in March 2006 under the Special Forces Direct Recruiting Scheme and on completion of his initial employment training, was posted to the then 4th Battalion (Commando), The Royal Australian Regiment, now the 2nd Commando Regiment, in September 2006. Lance Corporal Chidgey deployed on six tours to Afghanistan ranging from two weeks to six months. Lance Corporal Chidgey’s colleagues in the 2nd Commando Regiment describe him as a brilliant bloke to know and work with, who was loyal to the core and would do anything for his mates. A consummate professional and a dedicated soldier, Lance Corporal Chidgey was one of the hardest working members of the Regiment, who never sought recognition or reward. Returned from Active Service Badge. Operation SLIPPER (Afghanistan) June – November 2008. Corporal Baird was a member of the Special Operations Task Group and was from the 2nd Commando Regiment based at Holsworthy Barracks in Sydney, New South Wales. He joined the Army in January 2000 and upon completion of his initial employment training was posted to the then 4th Battalion (Commando), The Royal Australian Regiment, now the 2nd Commando Regiment, in February 2000. Corporal Baird was an outstanding Special Forces soldier. He exemplified what it meant to be a Commando, living by the attributes of uncompromising spirit and honour, which in turn earned him the unconditional respect of his fellow Commandos. His leadership in action was exemplary, constantly inspiring those around him to achieve greater things. Corporal Baird was an extremely dedicated and disciplined soldier, always striving for excellence in everything he did. Corporal Baird died how he lived at the front, giving it his all, without any indecision. He will forever be remembered by his mates and the soldiers he served with in the 2nd Commando Regiment. Corporal Baird is survived by his parents, brother and his partner. Corporal Baird was born in Burnie, Tasmania in 1981. Operation SLIPPER (Afghanistan) February 2013 June 2013. Corporal Smith was killed in AFG on 21 Oct 12 whilst serving with the Special Operations Task Group when an improvised explosive device detonated during a mission in southern Afghanistan. Corporal Smith was from the Special Operations Engineer Regiment based at Holsworthy Barracks in Sydney, New South Wales. Corporal Smith is survived by his partner Liv, his parents Katrina Paterson and Murray Smith and sister Roxanne. Scott Smith was born in the Barossa Valley South Australia in 1988. He joined the Army in February 2006 and upon completion of his initial employment training, was posted to the 1st Combat Engineer Regiment, Darwin. In 2008, Corporal Smith was posted to the then Incident Response Regiment as a search operator. Corporal Smith was an exceptional soldier who possessed all the qualities and charisma of a great junior leader. He was described by his CO as a genuine, honest and dedicated member who was probably one of the best Junior Non-Commissioned Officers that the unit has seen. His loss will be deeply felt. OPERATION SLIPPER (Afghanistan) July 2012 October 2012. LCPL McDonald was serving with the Special Operations Task Group in Afghanistan when he was tragically killed in a helicopter crash on 30 August 2012. LCPL McDonald was born in Carnarvon, Western Australia in 1982. He joined the Army on 31 May 1999 and was posted to the 1st Battalion, The Royal Australian Regiment (1 RAR). On completion of his Selection and Training Course and Reinforcement Cycle, LCPL McDonald was posted to the then 4th Battalion (Commando), The Royal Australian Regiment, now the 2nd Commando Regiment, in August 2008. LCPL McDonald was on his sixth tour to Afghanistan. LCPL McDonald was quick witted and brought a positive energy to both his unit comrades and all those who served with him. A dedicated and enthusiastic professional soldier, he was always willing to come forward with ideas and solutions. He was a highly professional soldier, but his quiet nature and humility meant he always deflected credit back on to fellow members of his Company. LCPL McDonald is survived by his fiance, his mother and stepfather, and three brothers. the Returned from Active Service Badge. PTE Galagher was serving with the Special Operations Task Group in Afghanistan when he was tragically killed in a helicopter crash on 30 August 2012. PTE Galagher was born in Wee Waa, New South Wales in 1989. He joined the Army on 22 October 2007 and was posted to the 1st Battalion, The Royal Australian Regiment (1 RAR). On completion of his Selection and Training Course and Reinforcement Cycle, PTE Galagher was posted to the 2nd Commando Regiment in November 2011. PTE Galagher was on his second tour to Afghanistan. PTE Galagher always put in 110% in everything he did. He had a can-do attitude, always wanting to get the job done and taking everything in his stride. He was an enthusiastic young soldier who was very well respected by his mates from the Regiment. PTE Galagher is survived by his partner, his parents and sister. SGT Langley was serving with the Special Operations Task Group when he was killed during deliberate operations against a Taliban Safe Haven on 4 July 2011 in Afghanistan. The 35 year old SGT Langley was from the Sydney-based 2nd Commando Regiment. SGT Langley enlisted in the Australian Army on the 18th of April 1993 and after initial training and a short period in the Army Reserve was allocated to the 1st Battalion, The Royal Australian Regiment in 1994. He later successfully completed Commando selection and training and was posted to the 2nd Commando Regiment (then the 4th Battalion, The Royal Australian Regiment (Commando)) in 2004. SGT Langley has seen Operational service in East Timor and Afghanistan. Sergeant Todd Langley was a dedicated, knowledgeable and passionate warrior who did not seek the limelight, preferring instead to let his actions speak for themselves. His professionalism and leadership was infectious. SGT Langley leaves behind his beloved wife, three daughters, a son, loving parents, and a brother. SGT Langley was also posthumously awarded the United States Meritorious Service Medal. Sapper Rowan Robinson, Australia’s 27th casualty of the war in Afghanistan, was killed in action on the 6th June 2011 during an overnight operation to destroy a large cache of weapons discovered in northern Helmand province. Twenty-three year old Sapper Robinson was from the Incident Response Regiment – now renamed the Special Operations Engineer Regiment. Sapper Robinson was born in Wahroonga, NSW in 1987. He joined the Army in 2006 and after his initial recruit training joined the 3rd Combat Engineer Regiment. After four years of service he was posted to the Incident Response Regiment at the start of 2010 where he completed his reinforcement cycle. This was Sapper Robinson’s second deployment to Afghanistan, having deployed on Operation Slipper in 2007. His colleagues described him as a superb young man who was fit, happy go lucky and a great team member. Sapper Robinson was a dedicated and professional soldier whose skill belied his youth. Those who had the pleasure of meeting him instantly warmed to him and his easy going nature made him popular with his peers and chain of command alike. Sapper Robinson left behind his loving mother, father, sister and two brothers. He has also been awarded the Army Combat Badge and the Return from Active Service Badge. OPERATION SLIPPER (Afghanistan) – Sep 2007 – Apr 2008. OPERATION SLIPPER (Afghanistan) – Mar 2011 – Jun 2011. SGT Brett Wood was serving with the Special Operations Task Group when he was tragically killed by an explosive device in the conduct of operations within a Taliban safe haven in Afghanistan, on 23 May 2011. 32 year old SGT Wood was from the Sydney-based 2nd Commando Regiment. SGT Wood enlisted in the Australian Regular Army on the 13th of February 1996 and post initial training was allocated to the 6th Battalion, The Royal Australian Regiment. He later successfully completed Commando training and was posted to 2nd Commando Regiment (then the 4th Battalion, The Royal Australian Regiment (Commando)) in 1998. SGT Wood has seen Operational service in Bougainville, East Timor, Iraq and Afghanistan. He was an absolute professional emulated by many given his service was of the highest order and he excelled in everything he did. SGT Woods loss will be sorely felt by the unit, his mates and all who knew him. SGT Wood leaves behind his beloved wife, loving parents, sisters and brothers. SGT Wood was posthumously awarded the United States Meritorious Service Medal and in the 2012 Australia Day Honours List SGT Wood was posthumously awarded the Distinguished Service Medal. PTE Palmer was serving with the Special Operations Task Group when he tragically lost his life in a helicopter crash in Afghanistan, on 21 June 2010. 27 year old PTE Palmer was from the Sydney-based 2nd Commando Regiment. PTE Palmer enlisted in the Australian Army in 2001. Following his basic training he joined 5th/ 7th Battalion, The Royal Australian Regiment (Mechanised) and saw service in East Timor and Iraq. PTE Palmer successfully undertook Commando Selection and Training in 2006 joining the then 4th Battalion, The Royal Australian Regiment (Commando) in Nov 2006. PTE Palmer has seen Operational service in East Timor, Iraq and Afghanistan. His professionalism was of the highest order and he excelled at everything he did. PTE Palmer loved his job and working alongside his mates. PTE Palmer leaves behind his loving parents and brother. PTE Chuck was serving with the Special Operations Task Group when he tragically lost his life in a helicopter crash in Afghanistan, on 21 June 2010. 27 year old PTE Chuck was from the Sydney-based 2nd Commando Regiment. PTE Chuck was born in Atherton, QLD in 1983. He joined the Army on 11 May 2004 as part of the Special Forces Direct Recruiting Scheme. On completion of his Commando Selection and Training Course and Reinforcement Cycle he was posted to the then 4th Battalion, The Royal Australian Regiment (Commando). PTE Chuck was an outstanding Commando who was highly trained and excelled at all he attempted. PTE Chuck was the Patrol Medic within his sniper team. He was suited to this role as his affectionate and caring nature drove his passion for helping his mates. PTE Chuck leaves behind his loving parents, brother, sister, and his beloved partner. Return from Active Service Badge. OPERATION SLIPPER (Afghanistan) – 2010. PTE Aplin was serving with the Special Operations Task Group when he tragically lost his life in a helicopter crash in Afghanistan, on 21 June 2010. 38 year old PTE Aplin was from the Sydney-based 2nd Commando Regiment. PTE Aplin enlisted in the Australian Army Reserves on 04 Feb 1992. PTE Aplin transferred to the Regular Army on 20 Sep 1995, reaching the rank of Sergeant. He successfully completed the Commando Selection and Training Course in 2008 and was posted to the then 4th Battalion, The Royal Australian Regiment (Commando) in January 2009 after completing the Commando Reinforcement Cycle. To achieve this goal he willingly took the required reduction in rank from Sergeant to Private. PTE Aplin was an outstanding and dedicated Commando who was highly respected. This was his second tour to Afghanistan. PTE Aplin leaves behind his beloved wife, 2 children, 2 step-children and loving mother. 30 year old LCPL Edwards was serving with the Sydney-based 2nd Commando Regiment when he was killed in an operational training accident at Cultana Range, South Australia on 20 October 2009. LCPL Edwards enlisted into the Australian Army in January 2004 as one of the first members of the Special Forces Direct Recruiting Scheme. After recruit and initial employment training, he successfully completed the Commando Selection and Training Course. He was posted to the then 4th Battalion, The Royal Australian Regiment (Commando). Throughout his short but extremely busy career, LCPL Edwards proved himself to be a consummate professional. During his tours to Afghanistan he demonstrated considerable mental toughness and physical endurance whilst deployed on combat operations. LCPL Edwards leaves behind his loving parents, two sisters, brother, and beloved partner. OPERATION SLIPPER (Afghanistan) – 2008. SGT Till was serving with the Special Operations Task Group in southern Afghanistan when he was killed while disarming a Taliban Improvised Explosive Device on 19 March 2009. 31 year old SGT Till was from the Sydney – based Incident Response Regiment (IRR) – now renamed the Special Operations Engineer Regiment. SGT Till was born in New South Wales, Australia. He enlisted in the Australian Regular Army on 17 July 2001. After completing Recruit training he was allocated to the Royal Australian Engineers and completed his Combat Engineer Initial Employment Training on 6 March 2002. His first posting was to the 1st Combat Engineer Regiment where he fulfilled a number of junior sapper roles and qualified in a range of mechanised combat engineering roles such as crewman driver, bridging and destruction of malfunction explosive ordnance. In 2002, SGT Till deployed on OP RELEX II, an operation focused on boarder protection to the north of Australia. On 20 June 2004, he was promoted to LCPL and in January 2005, was posted to the Incident Response Regiment as a combat engineer within the Chemical, Biological and Radiological Response Squadron. In September 2005, Brett was promoted to CPL and in late 2005 he completed the Explosive Ordinance Reconnaissance course. In 2007, SGT Till was posted to the School of Military Engineering as an Instructor and was given the opportunity to complete the Explosive Ordinance Disposal Technician course which was one of the highlights of his military career. In September 2008, Brett was temporarily promoted to SGT and was posted back to the Incident Response Regiment to conduct force preparation for OP SLIPPER. Brett was employed within 5 Troop, IRR as a Mobility and Survivability Team (MST) Commander and EOD Technician and spent September 2008 to February 2009 preparing with his troop for their deployment to Afghanistan. He deployed to Afghanistan on 24 February 2009 serving with the Special Operations Task Group 9. PTE Sher was serving with Special Operations Task Group in Oruzgan Province in southern Afghanistan when he was killed in a rocket attack on 4 January 2009. 30 year old PTE Sher was from the Melbourne – based sub-unit of 1st Commando Regiment. PTE Sher was born in South Africa in 1978 and moved to Australia with his family in 1986. He enlisted in the Australian Army in 1998 as a Reserve rifleman with the 5th /6th Battalion, The Royal Victorian Regiment and deployed to East Timor in 2002 attached to 5th / 7th Battalion, The Royal Australian Regiment (Mechanised). In 2004 he completed the Commando Selection Course and joined 1st Commando Regiment, going on to complete the suite of Special Forces courses required to become a qualified commando. In late 2008, Greg deployed to Afghanistan with the Special Operations Task Group. PTE Sher leaves behind his beloved partner, loving parents and two brothers. LT Fussell was serving with the Special Operations Task Group when he was killed by an Improvised Explosive Device while conducting a dismounted patrol in Oruzgan Province, Afghanistan, on 27 November 2008. 25 year old LT Fussell was from the Sydney-based 4th Battalion, The Royal Australian Regiment (Commando). LT Fussell enlisted in the Australian Army January 2002 and was appointed as an Officer Cadet at the Australian Defence Force Academy. He completed a Bachelor of Arts and was a keen sportsman, with a strong interest in rugby. He attended Royal Military College, Duntroon in 2005, commissioning in December 2005 into The Royal Regiment of Australian Artillery. On graduation he was posted to A Field Battery, 4th Field Regiment, where he fulfilled a number of junior officer roles. During his time at A Field Battery he qualified as a para-trooper. He also deployed to East Timor on Operation ASTUTE in 2006 and 2007. LT Fussell was posted to 4 RAR (CDO) in January 2008 as a Joint Offensive Support Team Commander. He was a Platoon Commander for the Advance Infantry Course at Singleton and completed the Joint Terminal Attack Controllers course. LT Fussell leaves behind two loving parents, his younger brother and two younger foster sisters. His brother is a Lieutenant with 1st Field Regiment, Royal Regiment of Australian Artillery in Brisbane. LCPL Marks was serving with the Special Operations Task Group when he was killed during deliberate operations against a Taliban Safe Haven on 27 April 2008 in Afghanistan. 27 year old LCPL Marks was from the Sydney-based 4th Royal Australian Regiment (Commando). On completion of his recruit training at Kapooka 1999, he was allocated to the Royal Regiment of Australian Artillery and was posted to the 4th Field Regiment in Townsville. During his service with Artillery, Jason deployed to East Timor with INTERFET in 1999, and gained the rank of Lance Bombardier in 2001. In April 2003 he transferred to the Royal Australian Army Medical Corps as an assistant medic until he volunteered for Commando selection in 2005. Jason first deployed to Afghanistan in 2006 with the Special Operations Task Group. He was deployed again to Timor Leste as part of Operation Astute with the Special Operations Task Group 2007 and again to Afghanistan in 2008. During the first three months of his deployment he was an active participant in a number of significant engagements with the Taliban and reinforced his reputation as a tough commando and a strong and effective junior leader. LCPL Marks leaves behind his beloved wife and 2 children, loving parents and brother. PTE Worsley was serving with Special Operations Task Group in Oruzgan Province in southern Afghanistan when he was killed in a deliberate operation against Taliban Leadership on 23 November 2007. 26 year old PTE Worsley was from the Sydney – based 4th Battalion, The Royal Australian Regiment (Commando). Private Worsley enlisted into the Australian Regular Army on 23 of October 2001. After completing his Recruit Training he was allocated to the Royal Australian Infantry Corps. At the completion of his Initial Employment Training, PTE Worsley was posted to the 1st Battalion, The Royal Australian Regiment (1 RAR). During his service with 1 RAR, PTE Worsley deployed to East Timor as part of OPERATION CITADEL, providing security to the people of East Timor. After two years of service with 1 RAR, PTE Worsley applied for service with the 4th Battalion, The Royal Australian Regiment (Commando). PTE Worsley deployed on his first tour to Afghanistan in 2006 and again in 2007. PTE Worsley was an extremely valued and respected member of his company group. He was physically fit, gifted, skilful, tough, selfless. He was a man who could be counted upon. PTE Worsley leaves behind his loving parents, five siblings and beloved partner. Unit Citation for Gallantry for his service with the Special Operations Task Group in 2006. Private Sean Ryan from 1 Commando Company died on 25th Sep 1983 after a speed march at Holsworthy NSW. Lance Corporal Kennedy from 1 Commando Company died on 14th Feb 1981 in a car accident in Gosford NSW when returning from his Basic Parachute Course. SGT Dan Lorkin died on 22nd September 1966 as a result of a roping accident at the Royal Melbourne Showgrounds when he was descending a rope between a light tower and an Army vehicle. Dan Lorkin grew up in Daylesford and attended St Patrick’s College, Ballarat where he was both a talented footballer and rowed with the St Patrick’s College team. He later moved to Melbourne to work and joined 2 Commando Company in late 1959. An excellent all-round athlete, SGT Lorkin often demonstrated standing forward somersaults during PT and unarmed combat training. He was at the annual camp in February 1960 during the Rip incident. Around 11.30 at night about 9 kilometres off Point Nepean he was in a Zodiac 3Z whose motor had broken down. He and his crew mates were eventually rescued by the shark boat Acquilla. 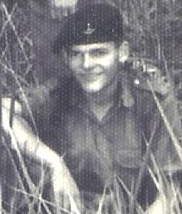 One of the early unit members to do the demanding SAS Recondo course Dan was an intelligent and skilful soldier who possessed the usual diggers’ initiative – as well as a quiet ability to get into mischief! In Major Noel Williams’ time (1965-1968) as in many previous years, 2 Commando Company demonstrated a wide range of their skills before large crowds at the Show. Along with unarmed combat displays, speed marching, para ground demonstrations and infantry tactics, the men did aerial rope work from the light towers. On this occasion there was a tragic accident. Dan had begun his slide down the rope, which ran from the top of the tower and was anchored to an army vehicle on the arena. When Dan was halfway down and Keith Hughes was about to step off the tower platform the rope snapped, throwing Dan to the ground. Fifty-plus years after his life was tragically cut short, those who served with him throughout the ‘60s remember Dan Lorkin. Private Stewart from 1 Commando Company died on 30th March 1966 when a gun pit collapsed at Gan Gan Training area NSW. Recruit Matulis from 1 Commando Company died on 13th Feb 1963 after a speed march at Georges Heights NSW. On the evening of February 17, 1960, 74 commandos from 2 Commando Company set off in army watercraft on a training exercise from Point Lonsdale to Point Nepean in Victoria , simulating a raid which involved them crossing the infamous Rip at the entrance to Port Phillip Bay. The weather changed without warning and the watercraft were swept out to sea through the Port Phillip heads encountering massive seas and some capsized. George ”Taffy” Drakopoulos and Eddie Meyer drowned before they could be rescued. Roger Wood, selflessly helped his fellow Commandos up a rope ladder on a larger rescue vessel to safety from a Zodiac inflatable, only then to be flung into the sea and lost somewhere beyond The Rip. The three victims were all from Melbourne, and aged around 20. Peter Herd was drowned while doing an “observe swim” to RVNS Cerberus at Half Moon Bay in Melbourne in October 1958. Peter was a member of a party of ten who walked under water to the sunken vessel about 350 metres offshore. On the return journey Peter and another frogman got into difficulties. Warrant Officer Peter Askew rescued the other soldier and then pulled Peter from the water. Corporal Herd was rushed to hospital when he failed to respond to resuscitation. The previous year Herd was the inaugural recipient of the Major John Anderson Shield awarded to the member of 2 Cdo Coy who had shown the greatest all round progress and dedication to the unit. Major John Anderson died as a result of drowning during a river crossing in the United Kingdom on 14th December 1955. OC designate Major John Anderson was sent in October 1955 to England for Commando training before taking up his posting as Officer Commanding 2 Commando Company, succeeding Major Peter Seddon. John Anderson graduated from Duntroon and served in the Third New Guinea Infantry Battalion and then in Japan with the Occupation Forces. Before leaving for the UK he also served with the First Royal Australian Regiment in Korea, from 1951 to 1953. In December 1955, undertaking a scramble course on almost the last day of the basic Commando course, Jack Anderson overtook 1 Cdo Coy OC Major Mac Grant (who was carrying an injured ankle) on the path to a river crossing. Grant reached the river in time to see Anderson swept away from the single rope and carried out of sight in the cold fast flowing river. Sadly leaving a wife, and two children aged one and four, Major Anderson was buried with full military honours at Drysdale near Geelong, in the town where he was born 32 years earlier.